You can complete the tasks in this chapter using SQL*Plus or Oracle SQL Developer. 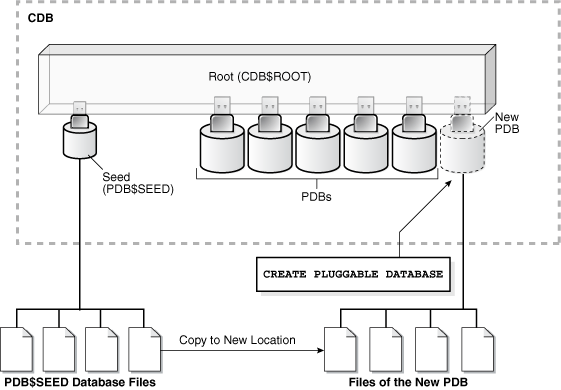 You can create a pluggable database (PDB) in a multitenant container database (CDB) by using the CDB seed or an application seed, cloning an existing PDB or non-CDB, plugging an unplugged PDB into a CDB, or using a non-CDB. You can remove a PDB from a CDB by unplugging the PDB or dropping the PDB. You can also create PDBs in application containers. Prerequisites must be met before creating a PDB. You can use the CREATE PLUGGABLE DATABASE statement to create a PDB in a CDB using the files of the CDB seed. You can also use this statement to create an application PDB in an application container using the files of an application seed or a CDB seed. You can create a PDB by cloning a local PDB, a remote PDB, or a non-CDB. You can create a PDB by relocating it from one CDB to another. You can create a PDB by plugging an unplugged PDB into a CDB. You can create a PDB as a proxy PDB by referencing a PDB in a remote CDB. You can create a PDB using a non-CDB in different ways. You can unplug a PDB from a CDB. The DROP PLUGGABLE DATABASE statement drops a PDB. You can drop a PDB when you want to move the PDB from one CDB to another or when you no longer need the PDB. This chapter discusses using SQL statements to create and remove PDBs. An easier way to create and remove PDBs is with a graphical user interface, such as of Database Configuration Assistant (DBCA), Oracle Enterprise Manager Cloud Control (Cloud Control), or Oracle Enterprise Manager Database Express (EM Express). A CDB can contain up to 4,096 PDBs, including PDBs, application roots, application PDBs, application seeds, and proxy PDBs. This number does not include the CDB root and the CDB seed. You can use various techniques to create a PDB. You use the CREATE PLUGGABLE DATABASE statement to create a PDB. To use this statement, you must understand the clauses for the statement and when to use each clause. When you create a PDB with the CREATE PLUGGABLE DATABASE statement, various clauses are available to you based on different factors, such as the technique you are using to create the PDB. You can determine which clauses to use by answering a series of questions. Creating a PDB is the process of associating the PDB with a CDB or an application container. You create a PDB when you want to use the PDB as part of the CDB or application container. Table 38-1 describes the techniques that you can use to create a PDB. Create a PDB in a CDB using the files of the CDB seed or application seed. This technique copies the files associated with the seed to a new location and associates the copied files with the new PDB. 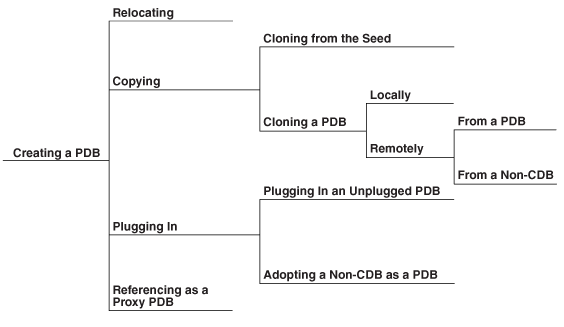 "Creating a PDB Using the Seed"
Create a PDB by cloning a source PDB or non-CDB. A source can be a PDB in the local CDB, a PDB in a remote CDB, a PDB in a local or remote application container, or a non-CDB. This technique copies the files associated with the source to a new location and associates the copied files with the new PDB. "Creating a PDB by Cloning an Existing PDB or Non-CDB"
Create a PDB by relocating it from one CDB to another. This technique moves the files associated with the PDB to a new location. "Creating a PDB by Relocating It"
Create a PDB by using the XML metadata file that describes the PDB and the files associated with the PDB to plug it into the CDB. Create a PDB as a proxy PDB by referencing a different PDB with a database link. The referenced PDB can be in the same CDB as the proxy PDB, or it can be in a different CDB. Create a PDB by adopting a non-CDB into a PDB. You can use the DBMS_PDB package to create an unplugged PDB from an Oracle Database 12c non-CDB. You can then plug the unplugged PDB into the CDB. 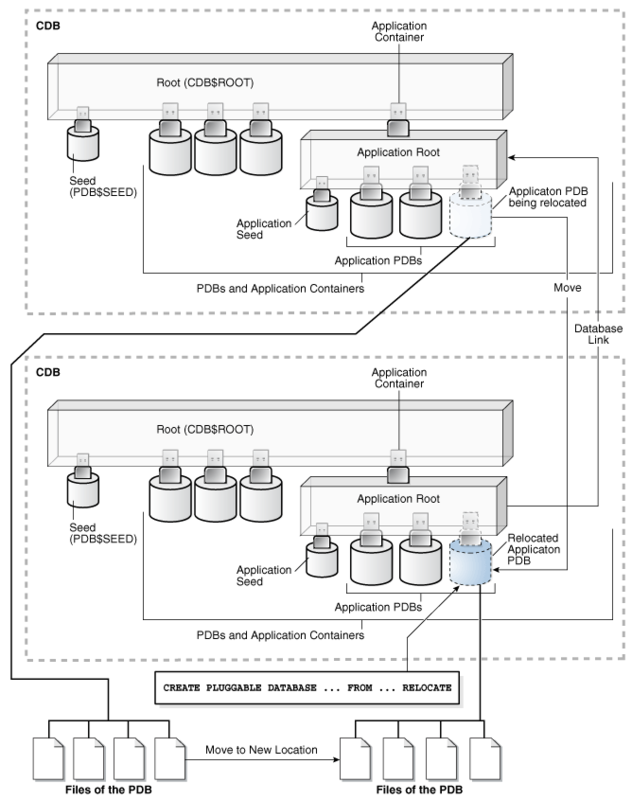 "About Creating a PDB Using a Non-CDB"
Description of "Figure 38-1 Options for Creating a PDB"
Creating an application container is the process of associating the application container with a CDB. You can use all of these techniques to create an application container by including the AS APPLICATION CONTAINER clause in the CREATE PLUGGABLE DATABASE statement. When you create a PDB, it can be associated with a CDB or with an application container. When the current container is a CDB root and you create a PDB, the PDB is associated with the CDB root. When the current container is an application root in an application container, and you create a PDB, the PDB is associated with the application root. When cloning a PDB into an application container, relocating a PDB to an application container, or plugging in a PDB into an application container, the PDB’s application name and version must match the application container’s application name and version. You can unplug a PDB when you want to plug it into a different CDB. You can unplug or drop a PDB when you no longer need it. An unplugged PDB is not usable until it is plugged into a CDB. Creating a PDB by cloning a non-CDB is available starting with Oracle Database 12c Release 1 (12.1.0.2). Creating a PDB by relocating it or as a proxy PDB is available starting with Oracle Database 12c Release 2 (12.2.0.1). "Creating and Removing Application Containers with SQL*Plus"
"Unplugging a PDB from a CDB"
All of the techniques described in Table 38-1 use this statement. Starting with Oracle Database 12c Release 2 (12.2.0.1), you can also use the CREATE PLUGGABLE DATABASE statement to create application containers, application seeds, and application PDBs. The SQL statements that create PDBs and application PDBs are exactly the same. When a CREATE PLUGGABLE DATABASE statement is run in the CDB root, the PDB belongs to the CDB root. When a CREATE PLUGGABLE DATABASE statement is run in an application root, the application PDB belongs to the application root. You can create an application root by running a CREATE PLUGGABLE DATABASE statement with the AS APPLICATION CONTAINER clause when the CDB root is the current container. The optional STORAGE clause of the CREATE PLUGGABLE DATABASE statement specifies storage limits for PDBs. In the CREATE PLUGGABLE DATABASE statement, you can specify the locations of files used by the new PDB. The PATH_PREFIX clause of the CREATE PLUGGABLE DATABASE statement ensures that all directory object paths associated with the PDB are restricted to the specified directory or its subdirectories. It also ensures that the following files associated with the PDB are restricted to specified directory: the Oracle XML repository for the PDB, files created with a CREATE PFILE statement, and the export directory for Oracle wallets. Use the CREATE PLUGGABLE DATABASE ... USING statement to plug an unplugged PDB into a CDB. The SERVICE_NAME_CONVERT clause of the CREATE PLUGGABLE DATABASE statement renames the user-defined services of the new PDB based on the service names of the source PDB. The TEMPFILE REUSE clause of the CREATE PLUGGABLE DATABASE statement specifies that an existing temp file in the target location is reused. The DEFAULT TABLESPACE clause of the CREATE PLUGGABLE DATABASE statement specifies the default tablespace for the new PDB. The USER_TABLESPACES clause of the CREATE PLUGGABLE DATABASE statement specifies which tablespaces are available in the new PDB. The logging_clause of the CREATE PLUGGABLE DATABASE statement specifies the logging attribute of the PDB. The logging attribute controls whether certain DML operations are logged in the redo log file (LOGGING) or not (NOLOGGING). The STANDBYS clause of the CREATE PLUGGABLE DATABASE statement specifies whether the new PDB is included in standby CDBs. The REFRESH MODE clause of the CREATE PLUGGABLE DATABASE statement specifies whether a PDB created as a clone can be refreshed periodically. Each PDB refresh propagates changes from the source PDB to the new PDB. With the CREATE PLUGGABLE DATABASE statement, you can create an application container. You can also create an application seed in an application container. The host name and port number settings for a PDB are important only if proxy PDBs will reference the PDB. Use the PORT clause to specify the PDB’s port number. Use the HOST clause to specify the PDB’s host name. "Creating and Removing Application Containers and Seeds with SQL*Plus"
Use MAXSIZE and a size clause to specify a limit, or set MAXSIZE to UNLIMITED to indicate no limit. Use MAX_AUDIT_SIZE and a size clause to specify a limit, or set MAX_AUDIT_SIZE to UNLIMITED to indicate no limit. Use MAX_DIAG_SIZE and a size clause to specify a limit, or set MAX_DIAG_SIZE to UNLIMITED to indicate no limit. If STORAGE UNLIMITED is set, or if there is no STORAGE clause, then there are no storage limits for the PDB. The following are examples that use the STORAGE clause. This STORAGE clause specifies that the storage used by all tablespaces that belong to the PDB must not exceed 2 gigabytes. This STORAGE clause specifies unlimited storage for all tablespaces that belong to the PDB. The FILE_NAME_CONVERT clause specifies the names of the PDB's files after the PDB is created. Use this clause when the files are not yet at their ultimate destination, and you want to copy or move them during PDB creation. You can use this clause in any CREATE PLUGGABLE DATABASE statement. Starting with Oracle Database 12c Release 1 (12.1.0.2), the CREATE_FILE_DEST clause specifies the default Oracle Managed Files file system directory or Oracle ASM disk group for the PDB's files. Use this clause to enable Oracle Managed Files for the new PDB, independent of any Oracle Managed Files default location specified in the root for the CDB. You can use this clause in any CREATE PLUGGABLE DATABASE statement. This initialization parameter specifies the default location for Oracle Managed Files for the CDB. When this parameter is set in a PDB, it specifies the default location for Oracle Managed Files for the PDB. This initialization parameter maps names of existing files to new file names when processing a CREATE PLUGGABLE DATABASE statement. The following table shows the precedence order when both clauses are used in the same CREATE PLUGGABLE DATABASE statement, and both initialization parameters are set. For each clause and initialization parameter, the table also shows whether the files created by the CREATE PLUGGABLE DATABASE statement will use Oracle Managed Files or not. Will the Files Created by CREATE PLUGGABLE DATABASE Use Oracle Managed Files? Regarding the use of Oracle Managed Files, the table only applies to files created by the CREATE PLUGGABLE DATABASE statement. Files created for the PDB after the PDB has been created might or might not use Oracle Managed Files. In addition, if FILE_NAME_CONVERT and CREATE_FILE_DEST are both specified in the CREATE PLUGGABLE DATABASE statement, then the FILE_NAME_CONVERT setting is used for the files being placed during PDB creation, and the CREATE_FILE_DEST setting is used to set the DB_CREATE_FILE_DEST initialization parameter in the PDB. 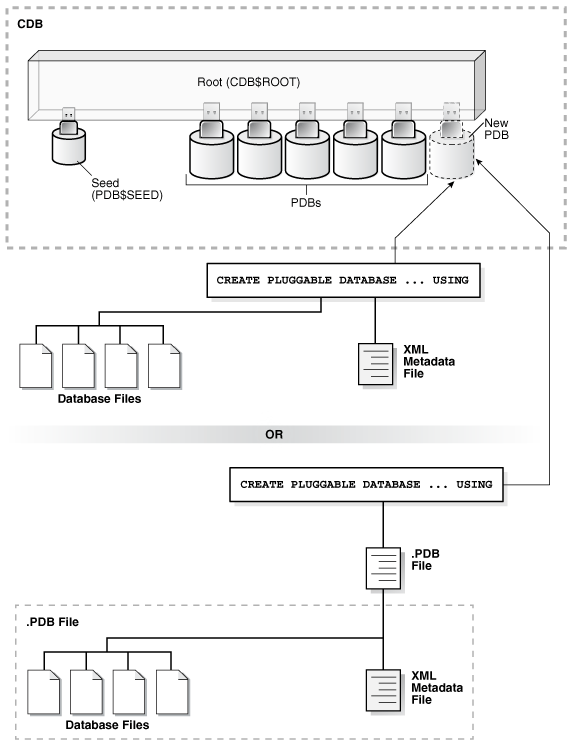 In this case, Oracle Managed Files controls the location of the files for the PDB after PDB creation. The PATH_PREFIX clause does not affect files created by Oracle Managed Files. If the PDB will not use Oracle Managed Files, then the FILE_NAME_CONVERT clause of the CREATE PLUGGABLE DATABASE statement specifies how to generate the names of files (such as data files) using the names of existing files. The CREATE_FILE_DEST clause of the CREATE PLUGGABLE DATABASE statement enables Oracle Managed Files for the PDB and specifies the default file system directory or Oracle ASM disk group for the PDB's files. The PDB’s data files and temp files are restricted to the specified directory and its subdirectories. The string2 file name pattern replaces the string1 file name pattern, and the string4 file name pattern replaces the string3 file name pattern. You can use as many pairs of file name pattern and replacement file name pattern strings as required. If you specify an odd number of strings (the last string has no corresponding replacement string), then an error is returned. Do not specify more than one pattern/replace string that matches a single file name or directory. NONE when no files should be copied or moved during PDB creation. Omitting the FILE_NAME_CONVERT clause is the same as specifying NONE. You can use the FILE_NAME_CONVERT clause in any CREATE PLUGGABLE DATABASE statement. When the FILE_NAME_CONVERT clause is not specified in a CREATE PLUGGABLE DATABASE statement, either Oracle Managed Files or the PDB_FILE_NAME_CONVERT initialization parameter specifies how to generate the names of the files. If you use both Oracle Managed Files and the PDB_FILE_NAME_CONVERT initialization parameter, then Oracle Managed Files takes precedence. The FILE_NAME_CONVERT clause takes precedence when it is specified. File name patterns specified in the FILE_NAME_CONVERT clause cannot match files or directories managed by Oracle Managed Files. This FILE_NAME_CONVERT clause generates file names for the new PDB in the /oracle/pdb5 directory using file names in the /oracle/dbs directory. If a file system directory is specified as the default location in this clause, then the directory must exist. Also, the user who runs the CREATE PLUGGABLE DATABASE statement must have the appropriate privileges to create files in the specified directory. Alternatively, you can specify the name of a directory object that exists in the CDB root (CDB$ROOT). The directory object points to the file system directory used by CREATE_FILE_DEST. If there is a default Oracle Managed Files location for the CDB set in the CDB root, then the CREATE_FILE_DEST setting overrides the CDB root’s setting, and the specified CREATE_FILE_DEST setting is used for the PDB. If CREATE_FILE_DEST=NONE is specified, then Oracle Managed Files is disabled for the PDB. When the CREATE_FILE_DEST clause is set to a value other than NONE, the DB_CREATE_FILE_DEST initialization parameter is set implicitly in the PDB with SCOPE=SPFILE. If the CDB root uses Oracle Managed Files, and this clause is not specified, then the PDB inherits the Oracle Managed Files default location from the CDB root. This CREATE_FILE_DEST clause specifies /oracle/pdb2/ as the default Oracle Managed Files file system directory for the new PDB. Use this clause when you want to ensure that a PDB's files reside in a specific directory and its subdirectories. An absolute path that is used as a prefix for all file paths associated with the PDB. The name of a directory object that exists in the CDB root (CDB$ROOT). The directory object points to the absolute path to be used for PATH_PREFIX. NONE to indicate that there are no restrictions for the file paths. Omitting the PATH_PREFIX clause is the same as specifying NONE. After a PDB is created, its PATH_PREFIX setting cannot be modified. You can use the PATH_PREFIX clause in any CREATE PLUGGABLE DATABASE statement. This PATH_PREFIX clause ensures that all file paths associated with the PDB are restricted to the /disk1/oracle/dbs/salespdb/ directory. Be sure to specify the path name so that it is properly formed when file names are appended to it. For example, on UNIX systems, be sure to end the path name with a forward slash (/). After the PATH_PREFIX clause is specified for a PDB, existing directory objects might not work as expected, since the PATH_PREFIX string is always added as a prefix to all local directory objects in the PDB. The PATH_PREFIX clause only applies to user-created directory objects. It does not apply to Oracle-supplied directory objects. The PATH_PREFIX clause does not apply to data files or temporary files. If you are using Oracle Managed Files, then use the CREATE_FILE_DEST clause to restrict the locations of data files and temporary files. You can plug in a PDB by specifying the XML metadata file or by specifying a compressed archive file with a .pdb extension. An archive file includes the XML metadata file and the PDB’s files (such as the data files and wallet file). When you use a .pdb archive file when plugging in a PDB, this file is extracted when you plug in the PDB, and the PDB’s files are placed in the same directory as the .pdb archive file. Therefore, the clauses that specify the source file locations are not required when you use a .pdb archive file. When you specify an XML metadata file when plugging in a PDB, this file describes the names and locations of an unplugged PDB's source files. The XML file might not describe the locations of these files accurately if you transported the unplugged files from one storage system to a different one. The files are in a new location, but the file paths in the XML file still indicate the old location. The SOURCE_FILE_NAME_CONVERT clause specifies how to locate files (such as data files) listed in an XML file describing a PDB if they reside in a location different from that specified in the XML file. The clause contains information about each file listed in the XML file. Starting with Oracle Database 12c Release 1 (12.1.0.2), the SOURCE_FILE_DIRECTORY clause specifies the source directory of the files that will be used to create the new PDB. The clause specifies a directory that contains all of the files listed in the XML file. Using this clause is convenient when you have a large number of data files and specifying a SOURCE_FILE_NAME_CONVERT pattern for each file is not feasible. Use these clauses only when you are plugging in an unplugged PDB with a CREATE PLUGGABLE DATABASE ... USING statement with an XML metadata file (not a .pdb archive file). These clauses are mutually exclusive. You cannot use both clauses in a single CREATE PLUGGABLE DATABASE statement. The SOURCE_FILE_NAME_CONVERT clause of the CREATE PLUGGABLE DATABASE ... USING statement specifies how to locate files (such as data files) listed in an XML file describing a PDB if they reside in a location different from that specified in the XML file. The SOURCE_FILE_DIRECTORY clause of the CREATE PLUGGABLE DATABASE statement specifies the source directory of the files that will be used to create the new PDB. The clause specifies a directory that contains all of the files listed in the XML file for the unplugged PDB. When you use this clause, ensure that the files you want to use for the PDB reside in the replacement file name patterns. Move or copy the files to these locations if necessary. NONE when no file names need to be located because the PDB's XML file describes the file names accurately. Omitting the SOURCE_FILE_NAME_CONVERT clause is the same as specifying NONE. You can use the SOURCE_FILE_NAME_CONVERT clause only in a CREATE PLUGGABLE DATABASE statement with a USING clause that specifies an XML metadata file. Therefore, you can use this clause only when you are plugging in an unplugged PDB with an XML metadata file. You cannot use this clause when you are plugging in a PDB with a .pdb archive file. This SOURCE_FILE_NAME_CONVERT clause uses the files in the /disk2/oracle/pdb7 directory instead of the /disk1/oracle/pdb7 directory. In this case, the XML file describing a PDB specifies the /disk1/oracle/pdb7 directory, but the PDB should use the files in the /disk2/oracle/pdb7 directory. When you plug in a PDB, if the source files are all present in a single directory, then you can specify the directory name in this clause. The directory is scanned to find the appropriate files based on the unplugged PDB’s XML file. The absolute path of the source file directory. NONE when no files should be copied or moved during PDB creation. Omitting the SOURCE_FILE_DIRECTORY clause is the same as specifying NONE. You can use the SOURCE_FILE_DIRECTORY clause only in a CREATE PLUGGABLE DATABASE statement with a USING clause that specifies an XML metadata file. Therefore, you can use this clause only when you are plugging in an unplugged PDB with an XML metadata file. You cannot use this clause when you are plugging in a PDB with a .pdb archive file. You can specify this clause for configurations that use Oracle Managed Files and for configurations that do not use Oracle Managed Files. This SOURCE_FILE_DIRECTORY clause generates file names for the new PDB by using the source files in the /oracle/pdb5/ directory. When the service name of a new PDB conflicts with an existing service name in the CDB, plug-in violations can result. Use the SERVICE_NAME_CONVERT clause to rename services and avoid these violations. The string2 service name replaces the string1 service name, and the string4 service name replaces the string3 service name. You can use as many pairs of service names and replacement service names as required. If you specify an odd number of strings (the last string has no corresponding replacement string), then an error is returned. NONE when no service names need to be renamed. Omitting the SERVICE_NAME_CONVERT clause is the same as specifying NONE. You can use the SERVICE_NAME_CONVERT clause in any CREATE PLUGGABLE DATABASE statement, except for a CREATE PLUGGABLE DATABASE statement that creates a PDB from the CDB seed. The CDB seed cannot have user-defined services. However, you can use this statement for a CREATE PLUGGABLE DATABASE statement that creates an application PDB from an application seed in an application container. This clause does not apply to the default service for the PDB. The default service has the same name as the PDB. This SERVICE_NAME_CONVERT clause uses renames the salesrep service to salesperson. When you specify this clause, Oracle Database formats the temp file and reuses it. The previous contents of the file are lost. If this clause is specified, and there is no temp file in the target location, then Oracle Database creates a new temp file for the PDB. If you do not specify this clause, then the CREATE PLUGGABLE DATABASE statement creates a new temp file for the PDB. If a file exists with the same name as the new temp file in the target location, then an error is returned, and the PDB is not created. Therefore, if you do not specify the TEMPFILE REUSE clause, then ensure that such a temp file does not exist in the target location. Oracle Database will assign the default tablespace to any non-SYSTEM users who do not have a different permanent tablespace specified. When you create the PDB from the CDB seed or an application seed and specify the DEFAULT TABLESPACE clause, Oracle Database creates a smallfile tablespace and sets it as the default tablespace for the PDB. When you create the PDB using a method other than the using the CDB seed or application seed, such as cloning a PDB or plugging in an unplugged PDB, the default tablespace must be a tablespace that already exists in the source PDB. You can use this clause to separate the data for multiple schemas into different PDBs. For example, when you move a non-CDB to a PDB, and the non-CDB had a number of schemas that each supported a different application, you can use this clause to separate the data belonging to each schema into a separate PDB, assuming that each schema used a separate tablespace in the non-CDB. List one or more tablespaces to include. Specify ALL, the default, to include all of the tablespaces. Specify ALL EXCEPT to include all of the tablespaces, except for the tablespaces listed. Specify NONE to exclude all of the tablespaces. COPY: The files of the tablespaces are copied to a new location. MOVE: The files of the tablespaces are moved to a new location. NOCOPY: The files of the tablespaces are not copied or moved. SNAPSHOT COPY: The tablespaces are cloned with storage snapshots. NO DATA: The data model definition of the tablespaces is cloned but not the tablespaces’ data. When the compatibility level of the CDB is 12.2.0 or higher, the tablespaces that are excluded by this clause are created offline in the new PDB, and they have no data files associated with them. When the compatibility level of the CDB is lower than 12.2.0, the tablespaces that are excluded by this clause are offline in the new PDB, and all data files that belong to these tablespaces are unnamed and offline. This clause does not apply to the SYSTEM, SYSAUX, or TEMP tablespaces. Do not include these tablespaces in a tablespace list for this clause. The following are examples that use the USER_TABLESPACES clause. Assume that the non-CDB or PDB from which a PDB is being created includes the following tablespaces: tbs1, tbs2, and tbs3. This USER_TABLESPACES clause includes the tbs2 tablespace, but excludes the tbs1 and tbs3 tablespaces. Assume that the non-CDB or PDB from which a PDB is being created includes the following tablespaces: tbs1, tbs2, tbs3, tbs4, and tbs5. This USER_TABLESPACES clause includes the tbs1, tbs4, and tbs5 tablespaces, but excludes the tbs2 and tbs3 tablespaces. Assume that the non-CDB or PDB from which a PDB is being created includes the following tablespaces: tbs1, tbs2, tbs3, tbs4, and tbs5. This USER_TABLESPACES clause includes the tbs2 and tbs3 tablespaces, but excludes the tbs1, tbs4, and tbs5 tablespaces. This example shows a full CREATE PLUGGABLE DATABASE statement that plugs in a non-CDB and only includes the tbs3 user tablespace from the non-CDB. The example copies the files for Oracle-supplied tablespaces (such as SYSTEM and SYSAUX) to a new location, but moves the files of the tbs3 user tablespace. LOGGING, the default, indicates that any future tablespaces created within the PDB will be created with the LOGGING attribute by default. NOLOGGING indicates that any future tablespaces created within the PDB will be created with the NOLOGGING attribute by default. You can override the default logging attribute by specifying either LOGGING or NOLOGGING at the schema object level--for example, in a CREATE TABLE statement. The specified attribute is used to establish the logging attribute of tablespaces created within the PDB if the logging_clause is not specified in the CREATE TABLESPACE statement. The DBA_PDBS view shows the current logging attribute for a PDB. "Controlling the Writing of Redo Records"
ALL includes the new PDB in all of the standby CDBs. ALL EXCEPT includes the new PDB in all of the standby CDBs except the specified standby CDBs. If more than one standby CDB is excluded, use a comma-separated list of the excluded standby CDBs. A comma-separated list of the standby CDBs. The new PDB is included in the listed standby CDBs. NONE excludes the new PDB from all of the standby CDBs. When a PDB is not included in any of the standby CDBs, the PDB's data files are offline and marked as unnamed on all of the standby CDBs. Any new standby CDBs that are instantiated after the PDB has been created must disable the PDB for recovery explicitly to exclude it from the standby CDB. It is possible to enable a PDB on a standby CDB after it was excluded on that standby CDB. This example shows a STANDBYS clause that includes the new PDB in all standby CDBs except standby CDB standby1 and standby CDB standby2. This example shows a STANDBYS clause that includes the new PDB in a list of standby CDBs. The list includes the standby CDBs standby1, standby2, and standby3. The dictionary data in the source PDB is cloned, but all user-created table and index data from the source PDB is discarded. This clause is useful for quickly creating clones of a PDB with only the object definitions and no data. Use this clause only when you are cloning a PDB with a CREATE PLUGGABLE DATABASE ... FROM statement. This clause does not apply to the SYSTEM and SYSAUX tablespaces. If user-created database objects in the source PDB are stored in one of these tablespaces, the database objects will contain data in the cloned PDB. You can use this clause to make the creation of PDBs faster by using more than one parallel execution server to copy the new PDB’s data files to a new location. When the compatibility level of the CDB is 12.2.0 or higher, the CDB chooses the degree of parallelism to use for PDB creation by default. Alternatively, you can specify the desired degree of parallelism in the clause, but the CDB can ignore the suggestion, depending on the current database load and the number of available parallel execution servers. When a value of 0 or 1 is specified, the CDB does not parallelize the creation of the PDB. Specifying 0 or 1 can result in longer PDB creation time. Use this clause only when you are creating a PDB from the CDB seed or an application seed, or when you are cloning a PDB. Specify REFRESH MODE NONE, the default, to create a PDB that is not refreshable. Specify REFRESH MODE MANUAL to create a refreshable PDB that must be refreshed manually. Specify REFRESH MODE EVERY number_of_minutes MINUTES to create a refreshable PDB that is refreshed automatically after the specified number of minutes has passed. A refreshable PDB that uses automatic refresh can also be refreshed manually. A refreshable PDB can be opened only in open read-only mode. Also, a refreshable PDB must be closed when a refresh is performed. If it is not closed when automatic refresh is attempted, then the refresh is deferred until the next scheduled refresh. If it is not closed when a user attempts to perform manual refresh, then an error is reported. The refreshable PDB must be kept in read-only mode to prevent out-of-sync changes on the refreshable PDB which do not occur on the source PDB. The refreshable PDB is intended to serve as a clone master and as such must accurately reflect the source PDB at the refreshed point in time. This clause is also supported in an ALTER PLUGGABLE DATABASE statement that modifies the refresh mode of a refreshable PDB. The ALTER PLUGGABLE DATABASE statement can switch from manual refresh to automatic refresh, or from automatic refresh to manual refresh. It can also change the number of minutes between automatic refreshes. A refreshable PDB and its source must be in different CDBs. Therefore, a refreshable PDB must be created at a CDB that is remote from the source CDB, and a database link must be specified during the creation. A PDB that is not refreshable cannot be changed into a refreshable PDB. However, a PDB that is refreshable can be changed into a PDB that is not refreshable by running an ALTER PLUGGABLE DATABASE statement with REFRESH MODE NONE for the PDB. When you create a refreshable PDB, you can set the REMOTE_RECOVERY_FILE_DEST initialization parameter in the PDB. This initialization parameter specifies a directory from which to read archive log files during refresh operations if the source PDB is not available over its database link. If new data files are created in the source PDB, then the PDB_FILE_NAME_CONVERT initialization parameter must be set in the CDB to convert the data file paths from the source PDB to the clone PDB. To create an application container, specify the AS APPLICATION CONTAINER clause of the CREATE PLUGGABLE DATABASE statement. To create an application seed in an application container, specify the AS SEED clause of the CREATE PLUGGABLE DATABASE statement. This clause creates an application container (not a PDB). When you include this clause in a CREATE PLUGGABLE DATABASE statement, you can use all of the techniques and clauses that are used for creating a PDB. When you include this clause, the current container must be a CDB root. It cannot be an application root. This clause creates an application seed in an application container. When you include this clause in a CREATE PLUGGABLE DATABASE statement, you can use all of the techniques and clauses that are used for creating a PDB. When you include this clause, the current container must be an application root. It cannot be the CDB root. An application container can have no application seed or one application seed. It cannot have more than one application seed. After an application seed is created, you can use it to create application PDBs in the application container. The application seed provides a quick way to create application PDBs that meet the requirements of the application container. The HOST clause of the CREATE PLUGGABLE DATABASE statement specifies the host name of the listener for the PDB being created. The PORT clause of the CREATE PLUGGABLE DATABASE statement specifies the port number of the listener for the PDB being created. The host name of the listener is different from the host name of the PDB being created. You plan to create proxy PDBs that reference the PDB being created. A proxy PDB uses a database link to establish communication with its referenced PDB. After communication is established, the proxy PDB communicates directly with the referenced PDB without using a database link. The host name of the listener must be correct for the proxy PDB to function properly. The port number of the listener is not 1521. A proxy PDB uses a database link to establish communication with its referenced PDB. After communication is established, the proxy PDB communicates directly with the referenced PDB without using a database link. The port number of the listener must be correct for the proxy PDB to function properly. The following table describes which CREATE PLUGGABLE DATABASE clauses you must specify based on different factors. Do you want to create an application container instead of a PDB? Specify the AS APPLICATION CONTAINER clause. Omit the AS APPLICATION CONTAINER clause. 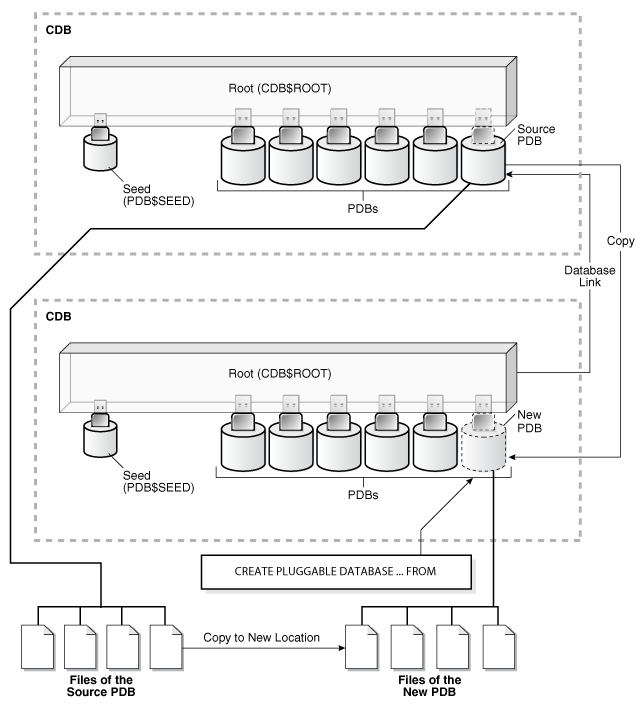 Are you plugging a PDB into a CDB that contains one or more PDBs that were created by plugging in the same PDB? Specify the AS CLONE clause to ensure that Oracle Database generates unique PDB DBID, GUID, and other identifiers expected for the new PDB. The PDB is plugged in as a clone of the unplugged PDB to ensure that all of its identifiers are unique. Omit the AS CLONE clause. Do you want to create an application seed in an application container? Specify the AS SEED clause. Omit the AS SEED clause. Do you want to use a CREATE_FILE_DEST clause to specify the Oracle Managed Files default location for the PDB's files? When creating a PDB from the CDB seed or an application seed, the source files are the files associated with the seed. Include a CREATE_FILE_DEST clause that specifies the default file system directory or Oracle ASM disk group for the PDB's files. Enable Oracle Managed Files for the CDB for it to determine the target locations. Specify the target locations in the PDB_FILE_NAME_CONVERT initialization parameter. See "File Location of the New PDB". Do you want to specify a default permanent tablespace for the PDB? Specify a DEFAULT TABLESPACE clause with the appropriate limits. Oracle Database will assign to this tablespace any non-SYSTEM users for whom you do not specify a different permanent tablespace. When creating a PDB from the CDB seed or an application seed, Oracle Database creates a smallfile tablespace and sets it as the default tablespace. When using a technique other than creation from the CDB seed or an application seed, the specified tablespace must exist in the source PDB. Omit the DEFAULT TABLESPACE clause. If you do not specify this clause, then the SYSTEM tablespace is the default permanent tablespace for non-SYSTEM users. Using the SYSTEM tablespace for non-SYSTEM users is not recommended. Do you want to use a FILE_NAME_CONVERT clause to specify the target locations of the files? Include a FILE_NAME_CONVERT clause that specifies the target locations of the files based on the names of the source files. Is the PDB a reference PDB with a dependent proxy PDB, and is the host name of its listener changing? Include a HOST clause and specify the host name of the listener for the PDB being created. For example, you might have a listener network for the physical host name and default port and also have configured a second listener bound to a virtual host name and virtual IP address with a non-default port number. Do you want to specify the logging attribute of the tablespaces in the new PDB? Do you want to copy or move the files to a new location? Include a FILE_NAME_CONVERT clause that specifies the target locations based on the names of the source files. Include a CREATE_FILE_DEST clause that specifies the Oracle Managed Files default location for the PDB's files. Enable Oracle Managed Files for it to determine the target locations. Do you want to specify that the data model definition of the source PDB is cloned but not the data of the source PDB? Include the NO DATA clause. Omit the NO DATA clause. Do you want to use multiple parallel execution servers to parallelize PDB creation? To let the CDB choose the degree of parallelism, include or omit the PARALLEL clause. To specify the degree of parallelism, specify the PARALLEL clause with an integer. For example, specify PARALLEL 4 to indicate a degree of parallelism of 4. Specify PARALLEL 0 or PARALLEL 1. Do you want to use a PATH_PREFIX clause to restrict file paths for the PDB for the following: directory objects, the Oracle XML repository for the PDB, files created with a CREATE PFILE statement, and the export directory for Oracle wallets? Include a PATH_PREFIX clause that specifies an absolute path. Set the PATH_PREFIX clause to NONE or omit it. Is the PDB a reference PDB with a dependent proxy PDB, and is the port number of its listener changing to a value other than 1521? Include a PORT clause and specify the port number of the listener for the PDB being created. For example, you might have a listener network for the physical host name and default port and also have configured a second listener bound to a virtual host name and virtual IP address with a non-default port number. Do you want to be able to refresh the PDB to propagate changes from the source PDB to the clone PDB? A refreshable PDB must be opened in open read-only mode. Include a REFRESH MODE MANUAL or REFRESH MODE EVERY minutes clause. Omit the REFRESH MODE clause or include a REFRESH MODE NONE clause. Do you want to grant predefined Oracle roles to the PDB_DBA role locally in the PDB? The new administrator for the PDB is granted the PDB_DBA common role locally in the PDB. By default, the CREATE PLUGGABLE DATABASE statement does not grant the administrator or the role any privileges. Include the ROLES clause and specify the predefined Oracle roles to grant to the PDB_DBA role. The specified roles are granted to the PDB_DBA role locally in the PDB. The user who runs the CREATE PLUGGABLE DATABASE statement does not need to be granted the specified roles. See Oracle Database Security Guide for information about predefined Oracle roles. Do you want to use a SERVICE_NAME_CONVERT clause to rename the user-defined services of the new PDB based on the service names of the source PDB? Include a SERVICE_NAME_CONVERT clause that specifies the new name of a service and the service name it is replacing. Specify multiple service names and replacement service names if necessary. Do you want to clone a PDB using a storage snapshot? Specify a SNAPSHOT COPY clause to indicate that cloning is to be performed using storage snapshots. Creating a PDB clone with storage snapshots makes creating a clone nearly instantaneous because it does not require copying the source PDB's data files. SNAPSHOT COPY is supported only if the underlying file system supports storage snapshots. Omit the SNAPSHOT COPY clause. Plugging in an unplugged PDB using an XML file directly. This clause does not apply to plugging in an unplugged PDB with a .pdb archive file. Are all of the source files in a single directory with new file names that would require multiple SOURCE_FILE_NAME_CONVERT entries? Specify the SOURCE_FILE_DIRECTORY with the full absolute path to the source files. Do the contents of the XML file accurately describe the locations of the source files? Use the SOURCE_FILE_NAME_CONVERT clause to specify the source file locations. Do you want to include the new PDB in one or more standby CDBs? Specify ALL, ALL EXCEPT, or a list of standby CDBs. Omit the STANDBYS clause or specify NONE. Do you want to limit the amount of storage that the PDB can use? Specify a STORAGE clause with the appropriate limits. Omit the STORAGE clause, or specify unlimited storage using the STORAGE clause. Do you want to reuse the temp file if a temp file exists in the target location? Include the TEMPFILE REUSE clause. Omit the TEMPFILE REUSE clause. Ensure that there is no file with the same name as the new temp file in the target location. Do you want to specify which tablespaces are included in the new PDB and which tablespaces are excluded from the new PDB? Include the USER_TABLESPACES clause and specify the tablespaces that are included in the new PDB. See " Creating and Configuring a CDB". The CDB must be in read/write mode. The current user must be a common user whose current container is the CDB root or an application container. The current user must have the CREATE PLUGGABLE DATABASE system privilege. You must decide on a unique container name for each container. Each container name must be unique in a single CDB, and each container name must be unique within the scope of all the CDBs whose instances are reached through a specific listener. The PDB name is used to distinguish a PDB from other PDBs in the CDB. PDB names follow the same rules as service names, which includes being case-insensitive. See Oracle Database Net Services Reference for information about the rules for service names. If you are creating a PDB in an Oracle Data Guard configuration with a physical standby database, then additional tasks must be completed before creating a PDB. See Oracle Data Guard Concepts and Administration for more information. If you are creating a PDB that includes data that was encrypted with Transparent Data Encryption, then follow the instructions in Oracle Database Advanced Security Guide. If you are creating a Database Vault-enabled PDB, then follow the instructions in Oracle Database Vault Administrator's Guide. You can use the CREATE PLUGGABLE DATABASE statement to create a new PDB by using the files of the CDB seed or an application PDB from the files of an application seed or the CDB seed. Using the CREATE PLUGGABLE DATABASE statement, you can create a PDB from the CDB seed, and you can create an application PDB from an application seed or the CDB seed. The statement copies these files to a new location and associates them with the new PDB. Figure 38-2 illustrates how this technique creates a new PDB in a CDB with the CDB root as the current container. 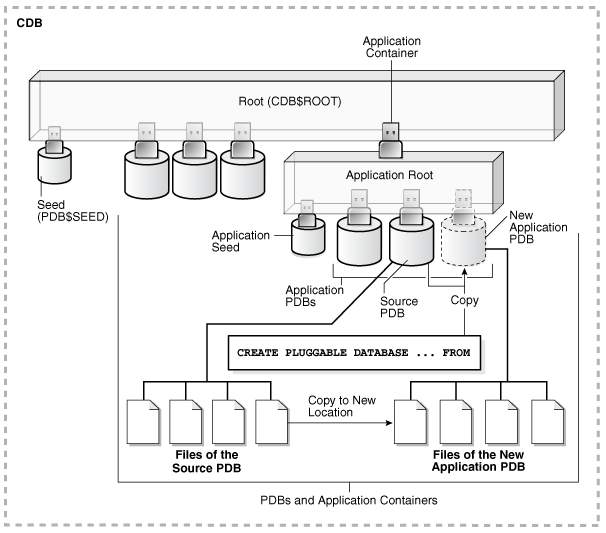 Description of "Figure 38-2 Create a PDB in the CDB Root Using the CDB Seed Files"
Figure 38-3 illustrates how this technique creates a new application PDB in an application container with the application root as the current container. 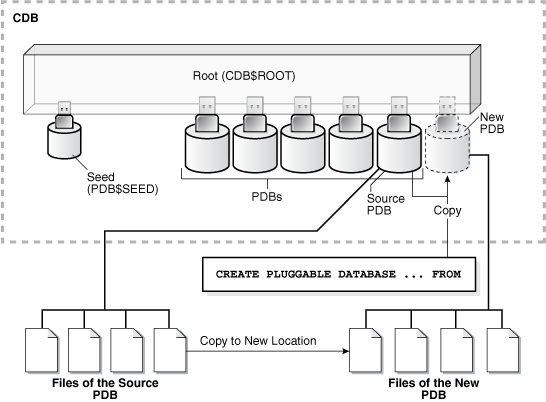 Description of "Figure 38-3 Create a PDB in an Application Root Using the Application Seed Files"
"The CREATE PLUGGABLE DATABASE Statement"
When an application container includes an application seed, and a the CREATE PLUGGABLE DATABASE statement is run in the application root to create an application PDB from the seed, the application PDB is created using the application seed. 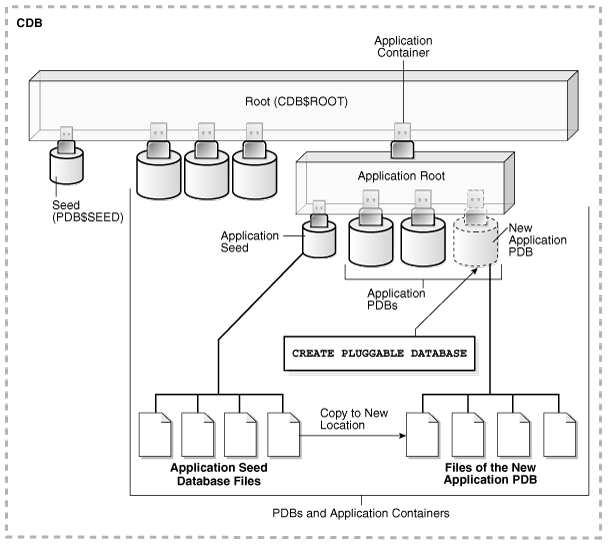 However, when an application container does not include an application seed, and a the CREATE PLUGGABLE DATABASE statement is run in the application root to create an application PDB from the seed, the application PDB is created using the CDB seed (PDB$SEED ). When you create a new PDB or application PDB from the seed, you must specify an administrator for the PDB or application PDB in the CREATE PLUGGABLE DATABASE statement. The statement creates the administrator as a local user in the PDB and grants the PDB_DBA role locally to the administrator. When you create a PDB using the CDB seed or an application seed, you must address the questions that apply to creating a PDB from the seed in Table 38-3. The table describes which CREATE PLUGGABLE DATABASE clauses you must specify based on different factors. Before creating a PDB from the CDB seed (PDB$SEED) or an application PDB from an application seed or the CDB seed, complete the prerequisites described in "Preparing for PDBs". In SQL*Plus, ensure that the current container is the CDB root or an application root. When the current container is the CDB root, the PDB is created in the CDB using the files of the CDB seed. When the current container is an application root, the application PDB is created in the application container using the files of the application seed. If there is no application seed in the application container, then the application PDB is created in the application container using the files of the CDB seed. See "About the Current Container" and "Accessing a Container in a CDB with SQL*Plus". Run the CREATE PLUGGABLE DATABASE statement, and specify a local administrator for the PDB. Specify other clauses when they are required. See "Examples of Creating a PDB from the Seed". After you create the PDB, it is in mounted mode, and its status is NEW. You can view the open mode of a PDB by querying the OPEN_MODE column in the V$PDBS view. You can view the status of a PDB by querying the STATUS column of the CDB_PDBS or DBA_PDBS view. A new default service is created for the PDB. The service has the same name as the PDB and can be used to access the PDB. Oracle Net Services must be configured properly for clients to access this service. See "Accessing a Container in a CDB with SQL*Plus". You must open the new PDB in read/write mode for Oracle Database to complete the integration of the new PDB into the CDB. An error is returned if you attempt to open the PDB in read-only mode. After the PDB is opened in read/write mode, its status is NORMAL. See "Modifying the Open Mode of PDBs" for more information. 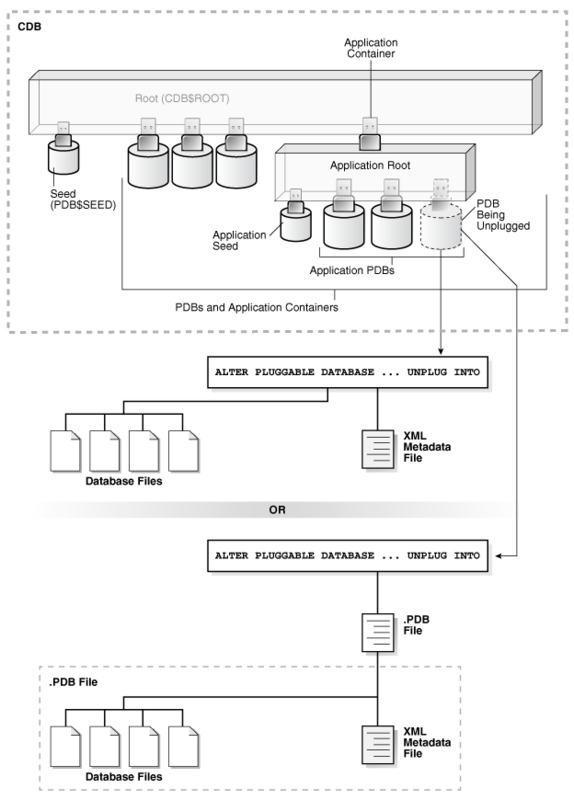 Oracle Database Backup and Recovery User's Guide for information about backing up a PDB. A local user with the name of the specified local administrator is created and granted the PDB_DBA common role locally in the PDB. If this user was not granted administrator privileges during PDB creation, then use the SYS and SYSTEM common users to administer to the PDB. If an error is returned during PDB creation, then the PDB being created might be in an UNUSABLE state. You can check a PDB's state by querying the CDB_PDBS or DBA_PDBS view, and you can learn more about PDB creation errors by checking the alert log. An unusable PDB can only be dropped, and it must be dropped before a PDB with the same name as the unusable PDB can be created. The following examples create a new PDB named salespdb and a salesadm local administrator given different factors. In addition to creating the salespdb PDB, this statement grants the PDB_DBA role to the PDB administrator salesadm and grants the specified predefined Oracle roles to the PDB_DBA role locally in the PDB. The PDB does not require a default tablespace. Either Oracle Managed Files is enabled for the CDB, or the PDB_FILE_NAME_CONVERT initialization parameter is set. The files associated with the CDB seed or application seed will be copied to a new location based on the Oracle Managed Files configuration or the initialization parameter setting. No predefined Oracle roles need to be granted to the PDB_DBA role. Either Oracle Managed Files is enabled, or the PDB_FILE_NAME_CONVERT initialization parameter is set. The files associated with the CDB seed or application seed will be copied to a new location based on the Oracle Managed Files configuration or the initialization parameter setting. The PDB_DBA role should be granted the following predefined Oracle role locally: DBA. Storage limits must be enforced for the PDB. Therefore, the STORAGE clause is required. Specifically, all tablespaces that belong to the PDB must not exceed 2 gigabytes. The single data file for the tablespace is sales01.dbf, and the statement creates it in the /disk1/oracle/dbs/salespdb directory. The SIZE clause specifies that the initial size of the tablespace is 250 megabytes. The AUTOEXTEND clause enables automatic extension for the file. The path prefix must be added to the PDB's directory object paths. Therefore, the PATH_PREFIX clause is required. In this example, the path prefix /disk1/oracle/dbs/salespdb/ is added to the PDB’s directory object paths. The CREATE_FILE_DEST clause will not be used, Oracle Managed Files is not enabled, and the PDB_FILE_NAME_CONVERT initialization parameter is not set. Therefore, the FILE_NAME_CONVERT clause is required. Specify the location of the data files for the CDB seed or application seed on your system. In this example, Oracle Database copies the files from /disk1/oracle/dbs/pdbseed to /disk1/oracle/dbs/salespdb. To view the location of the data files for the CDB seed or application seed, run the query in Example 45-7. You can use the CREATE PLUGGABLE DATABASE statement to clone a PDB from a source PDB or from a non-CDB. This section describes cloning a local PDB. After cloning a local PDB, the source and target PDBs are in the same CDB. You can create a PDB by cloning a remote source. The remote source can be a remote PDB or non-CDB. After the cloning operation is complete, the source and the target PDB are in different locations. Certain rules regarding users and tablespaces apply after cloning a PDB. 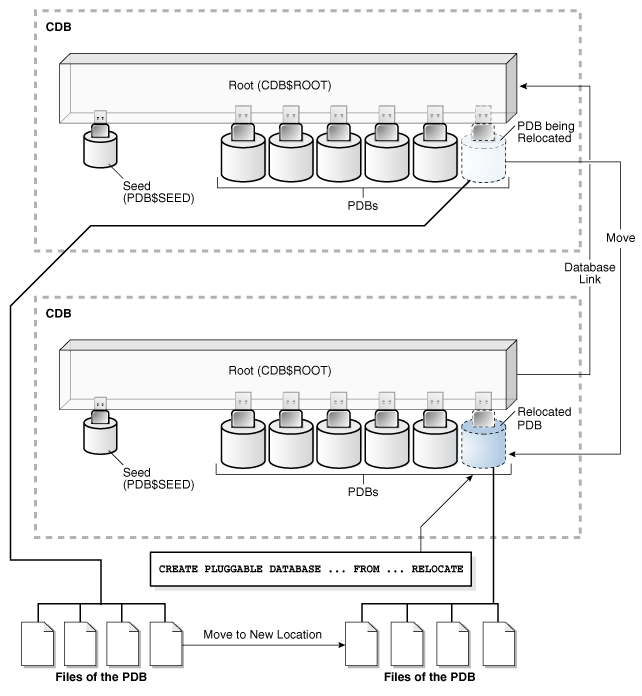 This technique clones a source PDB or non-CDB as a new PDB and automatically plugs the clone into the CDB. To use this technique, you must include a FROM clause that specifies the source. The source is the existing PDB or non-CDB that is copied. The target PDB is the clone of the source. The source can be a PDB in the local CDB, a PDB in a remote CDB, or a non-CDB. 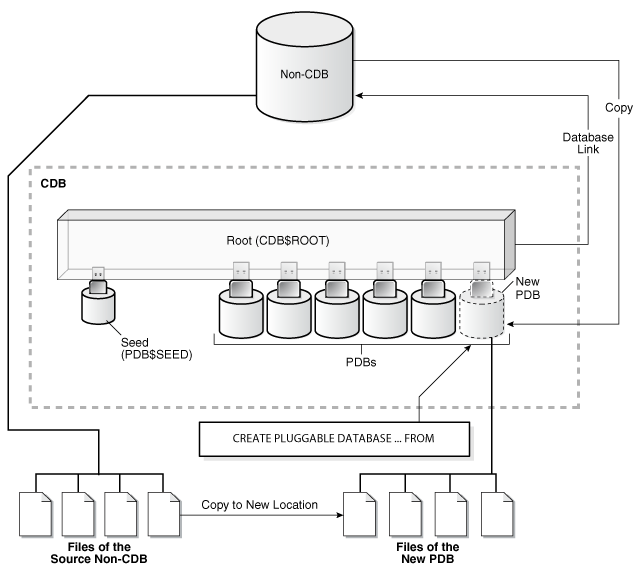 The CREATE PLUGGABLE DATABASE statement copies the files associated with the source to a new location and associates the files with the target PDB. When the CDB is in ARCHIVELOG mode and local undo mode, the source PDB can be opened in read/write mode and fully functional during the operation. Therefore, hot PDB cloning is supported. One use of cloning is for testing. Cloning enables you to create one or more clones of a PDB or non-CDB and safely test them in isolation. For example, you might test a new or modified application on a cloned PDB before using the application with a production PDB. Figure 38-4 illustrates how this technique creates a new PDB when the source is a local PDB. Description of "Figure 38-4 Clone a Local PDB"
When the source is a PDB is in a remote CDB, you must use a database link to clone the PDB. The database link must be created in the CDB that will contain the cloned PDB. When you issue the CREATE PLUGGABLE DATABASE statement from the root of the CDB that will contain the new PDB, you must specify a database link to the remote CDB that contains the PDB being cloned in the FROM clause. The database link connects either to the root of the remote CDB or to the remote source PDB from the CDB that will contain the new PDB. Figure 38-5 illustrates how this technique creates a new PDB when the source PDB is remote. Description of "Figure 38-5 Creating a PDB by Cloning a Remote PDB"
When the source is a non-CDB, you must specify a database link to the non-CDB in the FROM clause. Figure 38-6 illustrates how this technique creates a new PDB when the source is a remote non-CDB. 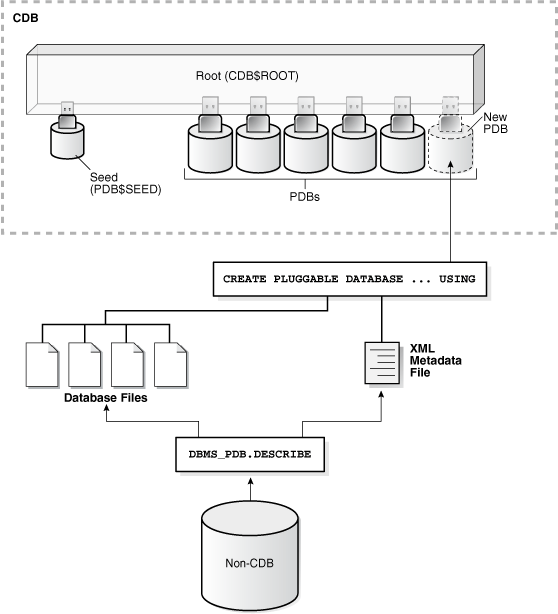 Description of "Figure 38-6 Creating a PDB by Cloning a Non-CDB"
In all cloning scenarios (local, remote, and from a non-CDB), when an application root is the current container when you run the CREATE PLUGGABLE DATABASE statement, the cloned PDB is created in the application container. In this case, the source PDB’s application name and version must match the application name and version of the application container. 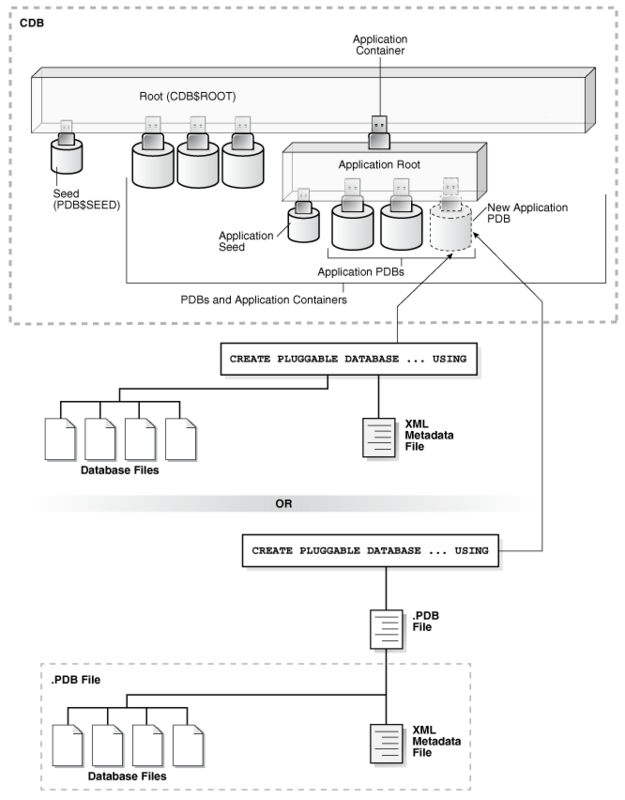 Figure 38-7 illustrates how this technique creates a new application PDB in an application container by cloning a local source application PDB. The source PDB can also be a PDB plugged into the local CDB root, a PDB plugged into a remote CDB root, or an application PDB plugged into a remote application root. Description of "Figure 38-7 Clone a PDB in an Application Container"
You cannot use the FROM clause in the CREATE PLUGGABLE DATABASE statement to create a PDB from the CDB seed (PDB$SEED) or from an application seed. See "Creating a PDB Using the Seed" for information about creating a PDB from the seed. When you clone a PDB, you must address the questions that apply to cloning a PDB in Table 38-3. The table describes which CREATE PLUGGABLE DATABASE clauses you must specify based on different factors. If you want to create the PDB by cloning another PDB or from a non-CDB, and if the source database has encrypted data or a keystore set, then you must provide the keystore password by including the keystore identified by keystore_password clause in the CREATE PLUGGABLE DATABASE ... FROM SQL statement. You must provide this password even if the source database is using an auto-login software keystore. You can determine whether the source database has encrypted data or a keystore by querying the DBA_ENCRYPTED_COLUMNS data dictionary view. You can clone a source PDB and configure the clone to be refreshable. To do so, include the REFRESH MODE clause of the CREATE PLUGGABLE DATABASE statement. When the clone PDB is refreshed, it is updated with any changes made to its source PDB. You can configure the clone PDB to refresh automatically at set intervals, or you can refresh it manually with the ALTER PLUGGABLE DATABASE REFRESH statement. The refreshable clone PDB and the source PDB must be in different CDBs. A refreshable clone PDB must be in either read-only mode or closed. It cannot be in read/write mode. However, you can change a refreshable clone PDB into an ordinary PDB by including the REFRESH MODE NONE clause in an ALTER PLUGGABLE DATABASE statement and then opening the PDB in read/write mode. An ordinary PDB cannot be changed into a refreshable clone PDB, and after a refreshable clone PDB is converted to an ordinary PDB, it cannot be changed back into a refreshable clone PDB. "Cloning a Remote PDB or Non-CDB"
When you use the SNAPSHOT COPY clause, all of the data files of the source PDB must be stored in the same storage type. When you use the SNAPSHOT COPY clause to create a clone of a source PDB and the CLONEDB initialization parameter is set to FALSE, the underlying file system for the source PDB's files must support storage snapshots. Such file systems include Oracle Automatic Storage Management Cluster File System (Oracle ACFS) and Direct NFS Client storage. Exadata supports snapshot copy functionality on ASM configured with sparse ASM grid disks. When you use the SNAPSHOT COPY clause to create a clone of a source PDB and the CLONEDB initialization parameter is set to TRUE, the underlying file system for the source PDB's files can be any local file system, network file system (NFS), or clustered file system that has Direct NFS enabled and supports sparse files. However, when the CLONEDB initialization parameter is set to TRUE, the source PDB must remain in open read-only mode as long as any clones exist. The source PDB's files must be located on an NFS volume. Storage credentials must be stored in a Transparent Data Encryption keystore. The storage user must have the privileges required to create and destroy snapshots on the volume that hosts the source PDB's files. Credentials must be stored in the keystore using an ADMINISTER KEY MANAGEMENT ADD SECRET SQL statement. secret is the storage password. client_name is the storage server. On a Linux or UNIX platform, it is the name entered in /etc/hosts or the IP address of the storage server. tag is the username passed to the storage server. keystore_password is the password for the keystore. See Oracle Database Advanced Security Guide for more information about managing keystores and secrets. PDB clones created using the SNAPSHOT COPY clause cannot be unplugged. They can only be dropped. Attempting to unplug a clone created using the SNAPSHOT COPY clause results in an error. Storage clones are named and tagged using the destination PDB's GUID. You can query the CLONETAG column of DBA_PDB_HISTORY view to view clone tags for storage clones. Snapshot copy behavior and efficiency are vendor specific and may vary between vendors. My Oracle Support Note 1597027.1 for more information about supported platforms for snapshot cloning of PDBs. Complete the prerequisites described in "Preparing for PDBs". The current user must have the CREATE PLUGGABLE DATABASE system privilege in both the root and the source PDB. The source PDB cannot be closed. If the CDB is not in local undo mode, then the source PDB must be in open read-only mode. This requirement does not apply if the CDB is in local undo mode. See "About the CDB Undo Mode". If the CDB is not in ARCHIVELOG mode, then the source PDB must be in open read-only mode. This requirement does not apply if the CDB is in ARCHIVELOG mode. If you are creating an application PDB, then the application PDB must have the same character set and national character set as the application container. If the database character set of the CDB is AL32UTF8, then the character set and national character set of the application container can be different from the CDB. However, all application PDBs in an application container must have same character set and national character set, matching that of the application container. You cannot use the REFRESH MODE clause to create a refreshable clone PDB that is a clone of a local PDB. A refreshable clone PDB must be created in a remote CDB. When the current container is the CDB root, the PDB is created in the CDB. When the current container is an application root, the application PDB is created in the application container. Run the CREATE PLUGGABLE DATABASE statement, and specify the source PDB in the FROM clause. Specify other clauses when they are required. See "Examples of Cloning a Local PDB". The following examples clone a local source PDB named pdb1 to a target PDB named pdb2 given different factors. Either Oracle Managed Files is enabled, or the PDB_FILE_NAME_CONVERT initialization parameter is set. Therefore, the FILE_NAME_CONVERT clause is not required. The files will be copied to a new location based on the Oracle Managed Files configuration or the initialization parameter setting. The path prefix must be added to the PDB's directory object paths. Therefore, the PATH_PREFIX clause is required. In this example, the path prefix /disk2/oracle/pdb2/ is added to the PDB’s directory object paths. The FILE_NAME_CONVERT clause is required to specify the target locations of the copied files. In this example, the files are copied from /disk1/oracle/pdb1 to /disk2/oracle/pdb2. The CREATE_FILE_DEST clause is not used, and neither Oracle Managed Files nor the PDB_FILE_NAME_CONVERT initialization parameter is used to specify the target locations of the copied files. To view the location of the data files for a PDB, run the query in Example 45-7. The PDB that is being cloned (pdb1) has two user-defined services: salesrep_ca and orders_ca for the sales representatives and order entry personnel in California. The new services will be for the sales representatives and order entry personnel in Oregon, and the service names will be renamed to salesrep_or and orders_or, respectively, in the cloned PDB (pdb2). Future tablespaces created within the PDB will be created with the NOLOGGING attribute by default. This feature is available starting with Oracle Database 12c Release 1 (12.1.0.2). The NO DATA clause is required because the goal is to clone the data model definition of the source PDB without cloning its data. The table has over six million rows. The table in the cloned PDB has no rows. The current user must have the CREATE PLUGGABLE DATABASE system privilege in the root of the CDB that will contain the target PDB. When cloning a PDB, if the remote CDB is not in local undo mode, then the source PDB must be in open read-only mode. This requirement does not apply if the remote CDB that contains the source PDB is in local undo mode. If the remote CDB or non-CDB is not in ARCHIVELOG mode, then the source PDB or non-CDB must be in open read-only mode. This requirement does not apply if the remote CDB that contains the source PDB or the non-CDB is in ARCHIVELOG mode. A database link must enable a connection from the CDB to which the PDB is being cloned to the source PDB’s CDB. The database link can connect to either the root of the CDB, to an application PDB if the source is an application PDB, or to the PDB. The user that the database link connects with must have the CREATE PLUGGABLE DATABASE system privilege. If the database link connects to the root in the source PDB’s CDB, then the user that the database link connects with must be a common user. If the character set of the CDB to which the PDB is being cloned is not AL32UTF8, then the source and target must have compatible character sets and national character sets. To be compatible, the character sets and national character sets must meet all of the requirements specified in Oracle Database Globalization Support Guide. If the character set of the CDB to which the PDB is being cloned is AL32UTF8, then this requirement does not apply. The CDB and the non-CDB must be running Oracle Database 12c Release 1 (12.1.0.2) or later. The data block size of the cloned PDB must match the CDB in which the clone PDB will reside. If you are creating an application PDB, then the application name and version of the source PDB must match the application name and version of the application container that will contain the target application PDB. If the database character set of the CDB is AL32UTF8, then the character set and national character set of the application container can different from the CDB. However, all application PDBs in an application container must have same character set and national character set, matching that of the application container. If you are creating a refreshable PDB, then the source PDB must be in ARCHIVELOG mode and local undo mode. In SQL*Plus, ensure that the current container is the root of the CDB that will contain the new PDB or the application root of the application container that will contain the new PDB. See "About the Current Container" and "About Accessing a Container in a CDB with SQL*Plus". Run the CREATE PLUGGABLE DATABASE statement, and specify the source PDB or the source non-CDB in the FROM clause. Specify other clauses when they are required. A new default service is created for the PDB. The service has the same name as the PDB and can be used to access the PDB. Oracle Net Services must be configured properly for clients to access this service. See "About Accessing a Container in a CDB with SQL*Plus". If you created the PDB from a non-CDB, then run the ORACLE_HOME/rdbms/admin/noncdb_to_pdb.sql script. This script must be run before the PDB can be opened for the first time. If the PDB was not a non-CDB, then running the noncdb_to_pdb.sql script is not required. The current user must have SYSDBA administrative privilege, and the privilege must be either commonly granted or locally granted in the PDB. The user must exercise the privilege using AS SYSDBA at connect time. See "About Accessing a Container in a CDB with SQL*Plus". The script opens the PDB, performs changes, and closes the PDB when the changes are complete. The following examples clone a remote PDB or non-CDB given different factors. The database link name to the remote PDB is pdb1_link. Either Oracle Managed Files is enabled, or the PDB_FILE_NAME_CONVERT initialization parameter is set. The files will be copied to a new location based on the Oracle Managed Files configuration or the initialization parameter setting. The database link name to the remote non-CDB is mydb_link. The refreshable clone will be refreshed automatically every 60 minutes. Remember that, to create a refreshable PDB, the source PDB must be in ARCHIVELOG mode and local undo mode. Users in the PDB who used the default temporary tablespace of the source non-CDB or PDB use the default temporary tablespace of the cloned PDB. Users who used non-default temporary tablespaces in the non-CDB or PDB continue to use the same local temporary tablespaces in the cloned PDB. See "About Managing Tablespaces in a CDB". When cloning a remote PDB, user-created common users that existed in the source CDB but not in the target CDB do not have any privileges granted commonly. However, if the target CDB has a common user with the same name as a common user in the PDB, the latter is linked to the former and has the privileges granted to this common user in the target CDB. Close the PDB, connect to the root, and create a common user account with the same name. When the PDB is opened in read/write mode, differences in roles and privileges granted commonly to the user account are resolved, and you can unlock the account. Privileges and roles granted locally to the user account remain unchanged during this process. Create a new local user account in the PDB and use Data Pump to export/import the locked user's data into the new local user's schema. Leave the user account locked. "Managing Services Associated with PDBs"
You can use the CREATE PLUGGABLE DATABASE statement to relocate a PDB from one CDB to another. You can create a PDB by relocating it. After the operation is complete, the PDB is removed from its current CDB and is added to a different CDB. This technique moves a PDB from one CDB to another. To use this technique, you run the CREATE PLUGGABLE DATABASE statement and include the FROM clause and the RELOCATE clause. You must include a FROM clause that specifies the current location of the PDB. You must also include the RELOCATE clause to specify that the PDB is being moved instead of cloned. After the operation is complete, the PDB is added to the CDB to which the PDB is relocated. The CREATE PLUGGABLE DATABASE statement also moves the files associated with the PDB to a new location. Using this technique is the fastest way to relocate a PDB with minimal down time. In addition, the PDB being relocated can be opened in read/write mode and fully functional during the relocation process. This technique automatically quiesces the PDB in its old location while transporting and applying redo data to the PDB in its new location. Finally, when the PDB is ready, this technique brings it online in its new location. While the PDB is being relocated, current DML and DDL operations will pause while they are redirected to the PDB’s new location. Queries continue to run with no pause. You must use a database link to relocate the PDB. The database link must be created in the CDB that will contain the relocated PDB. When you issue the CREATE PLUGGABLE DATABASE statement from the root of the CDB that will contain the relocated PDB, you must specify a database link to the remote CDB that contains the PDB being relocated in the FROM clause. The database link must connect to the root of the remote CDB from the CDB that will contain the new PDB. Figure 38-8 illustrates how this technique relocates a PDB. Description of "Figure 38-8 Relocate a PDB"
You can relocate a PDB into an application container as an application PDB, and you can relocate an application PDB from one application root to another. You can also relocate an empty application root from one CDB to another, but the application root must not have any hosted application PDBs. Figure 38-9 illustrates how this technique creates a new application PDB in an application container. Description of "Figure 38-9 Relocate a PDB Into an Application Container"
When you relocate a PDB, you must address the questions that apply to relocating a PDB in Table 38-3. The table describes which CREATE PLUGGABLE DATABASE clauses you must specify based on different factors. When a PDB is relocated, you have two options regarding connections to the PDB: AVAILABILITY MAX and AVAILABILITY NORMAL. You optionally can use the AVAILABILITY MAX clause to redirect connections from the old location of the PDB to the new location. When the AVAILABILITY MAX clause is specified, the relocate operation configures the listener to relocate connections to the new location. If your system is using Oracle Internet Directory (Oracle’s LDAP directory service), then connection information can be updated in a central location rather than in multiple client configuration files. If you use the same listener for the PDB in its old and new locations, then new connections are automatically routed to the PDB’s new location when relocation is complete. If the PDBs use different listeners, and you employ cross-registration of their respective listeners through configuration of the local_listener and remote_listener parameters, then relocation is seamless because the availability and location of the PDB’s services are automatically registered with the listeners. In an Oracle Clusterware environment, when relocating a PDB between different CDBs (not CDB instances of the same database), the non-default service resource must be recreated using SRVCTL. When the source and target CDBs for the relocate operation do not share a common listener network, use the AVAILABILITY MAX clause to automatically configure the original listener to forward connections to the new listener that is handling the relocated PDB’s connections. This configuration is intended to be transient while the Oracle Internet Directory (OID) is updated or the client connections are modified. A “tombstone” PDB remains in the source CDB to protect the PDB’s namespace and preserve the listener forwarding configuration until the OID server or the client connections are updated. After that is completed, the source PDB can be dropped with a DROP PLUGGABLE DATABASE statement. If the source CDB and target CDB for the relocation operation share a common listener network, forwarding client connections is not necessary as it is handled implicitly by the common listener network. In this case, use the AVAILABILITY NORMAL clause for the relocate operation. After the PDB is relocated to the target CDB and opened, the PDB on the source CDB is dropped. The current user must have the CREATE PLUGGABLE DATABASE system privilege in the root of the CDB to which the PDB is being relocated. The CDB that contains the PDB before relocation must be in local undo mode. If the CDB to which the PDB is being relocated is not in ARCHIVELOG mode, then the PDB must be in open read-only mode during the operation. This requirement does not apply if the CDB to which the PDB is being relocated is in ARCHIVELOG mode. A database link must enable a connection from the CDB to which the PDB is being relocated to the PDB’s current CDB. The database link must connect to the root of the CDB. If the PDB is an application PDB, then the database link must connect to its application root. If the character set of the CDB to which the PDB is being relocated is not AL32UTF8, then the PDB’s current CDB and the CDB to which it is being relocated must have compatible character sets and national character sets. To be compatible, the character sets and national character sets must meet all of the requirements specified in Oracle Database Globalization Support Guide. If you are creating an application PDB, then the application name and version of the PDB being relocated must match the application name and version of the application container that will contain the application PDB after it is relocated. Run the CREATE PLUGGABLE DATABASE statement. Specify the PDB in the FROM clause, and include the RELOCATE clause. Specify the AVAILABILITY MAX clause to redirect connections from the old location of the PDB to the new location. Specify other clauses when they are required. If an error is returned during PDB relocation, then the PDB being created might be in an UNUSABLE state. You can check a PDB's state by querying the CDB_PDBS or DBA_PDBS view, and you can learn more about PDB creation errors by checking the alert log. An unusable PDB can only be dropped, and it must be dropped before a PDB with the same name as the unusable PDB can be created. The current user has the CREATE PLUGGABLE DATABASE system privilege in the root of the CDB to which the PDB is being relocated. The common user c##myadmin has SYSOPER administrative privilege and CREATE PLUGGABLE DATABASE system privilege in the CDB that currently contains the PDB. This technique plugs in an unplugged PDB. This technique uses the XML metadata file that describes the PDB and the files associated with the PDB to plug it into the CDB. These files can be separate, or they can be included in a single, compressed .pdb archive file. You must meet prerequisites before plugging in an unplugged PDB. Certain rules regarding users and tablespaces apply after plugging in an unplugged PDB. You can plug in a PDB by specifying the XML metadata file or by specifying a compressed archive file with a .pdb extension. An archive file includes the XML metadata file and the PDB’s files (such as the data files and wallet file). The USING clause of the CREATE PLUGGABLE DATABASE statement specifies the XML metadata file or the .pdb archive file. When a .pdb archive file is not used and the XML metadata file is specified in the USING clause, the XML metadata file includes the full paths to the locations of the PDB's files. When the .pdb archive file is specified in the USING clause and the XML file is included in the .pdb archive file, the XML metadata file contains the file names only. Figure 38-10 illustrates how this technique creates a new PDB. 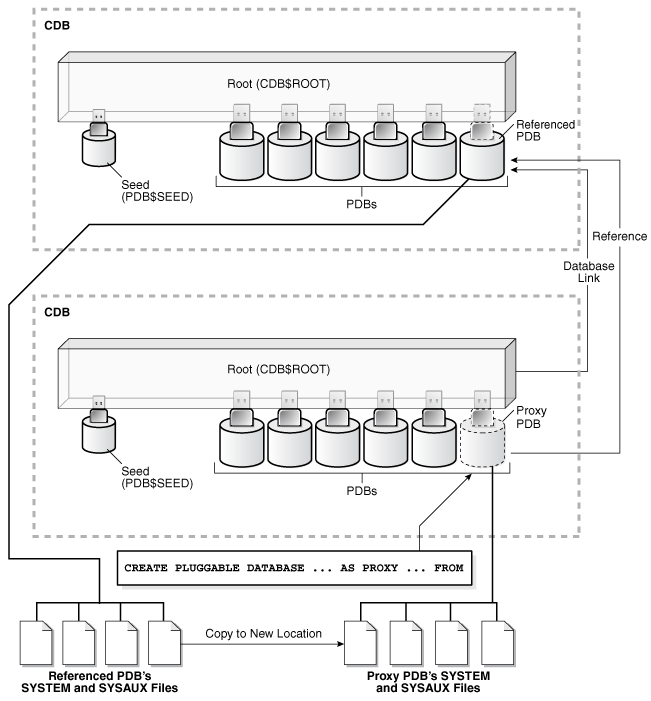 Description of "Figure 38-10 Plugging an Unplugged PDB Into a CDB Root"
Figure 38-11 illustrates how this technique creates a new application PDB in an application container. 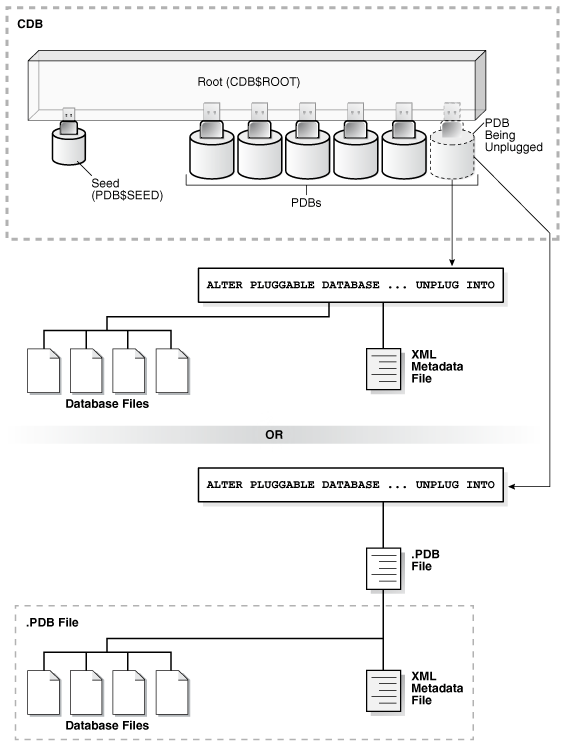 Description of "Figure 38-11 Plugging an Unplugged PDB Into an Application Root"
An unplugged PDB consists of an XML file that describes the PDB and the PDB's files (such as the data files and wallet file). You can use the CREATE PLUGGABLE DATABASE statement to plug in an unplugged PDB. To do so, you must include a USING clause that specifies the XML file that describes the PDB or a .pdb archive file. The source CDB is the CDB from which the PDB was unplugged. The target CDB is the CDB into which you are plugging the PDB. The source CDB and target CDB can be the same CDB or different CDBs. Automatic downgrade of a PDB is not supported. Therefore, you cannot plug in a PDB if the source CDB is a higher Oracle Database release than the target CDB. When you plug in an unplugged PDB, you must address the questions that apply to plugging in an unplugged PDB in Table 38-3. The table describes which CREATE PLUGGABLE DATABASE clauses you must specify based on different factors. Either the XML file that describes the PDB or the .pdb archive file must exist in a location that is accessible to the CDB. The USING clause must specify the XML file or the .pdb archive file. If the PDB's XML file is unusable or cannot be located, then you can use the DBMS_PDB.RECOVER procedure to generate an XML file using the PDB's data files. See Oracle Database PL/SQL Packages and Types Reference for more information about this procedure. If an XML file is specified in the USING clause (not a .pdb file), then the files associated with the PDB (such as the data files and wallet file) must exist in a location that is accessible to the CDB. If the character set of the CDB into which the PDB is being plugged is not AL32UTF8, then the CDB that contained the unplugged PDB and the target CDB must have compatible character sets and national character sets. To be compatible, the character sets and national character sets must meet all of the requirements specified in Oracle Database Globalization Support Guide. If the character set of the CDB into which the PDB is being plugged is AL32UTF8, then this requirement does not apply. If you are creating an application PDB, then the application name and version of the unplugged PDB must match the application name and version of the application container into which the application PDB is being plugged. You can use the DBMS_PDB.CHECK_PLUG_COMPATIBILITY function to determine whether these requirements are met. Step 2 in the following procedure describes using this function. In SQL*Plus, ensure that the current container is the root of the CDB into which you want to plug the PDB or an application root. (Optional) Run the DBMS_PDB.CHECK_PLUG_COMPATIBILITY function to determine whether the unplugged PDB is compatible with the CDB. If the PDB is not yet unplugged, then run the DBMS_PDB.DESCRIBE procedure to produce an XML file that describes the PDB. If the PDB is already unplugged, then proceed to Step 2.b. If the PDB is in a remote CDB, then you can include @database_link_name in the pdb_name parameter, where database_link_name is the name of a valid database link to the remote CDB or to the PDB. For example, if the database link name to the remote CDB is rcdb, then set the pdb_name value to SALESPDB@rcdb. - pdb_descr_file - Set this parameter to the full path to the XML file. - pdb_name - Specify the name of the new PDB. If this parameter is omitted, then the PDB name in the XML file is used. If the output is NO, then the PDB is not compatible, and you can check the PDB_PLUG_IN_VIOLATIONS view to see why it is not compatible. You can specify a .pdb archive file in the pdb_descr_file parameter. If the PDB is not unplugged, then unplug it. See "Unplugging a PDB from a CDB". Run the CREATE PLUGGABLE DATABASE statement, and specify the XML file or the .pdb archive file in the USING clause. Specify other clauses when they are required. See "Examples of Plugging In an Unplugged PDB". The following examples plug in an unplugged PDB named salespdb using the /disk1/usr/salespdb.xml file or the /disk1/usr/sales.pdb file given different factors. When the current container is the CDB root, the new PDB is created in the CDB. When the current container is an application root, the new application PDB is created in the application root’s application container. The new PDB is not based on the same unplugged PDB that was used to create an existing PDB in the CDB. Therefore, the AS CLONE clause is not required. The XML file accurately describes the current locations of the files. Therefore, the SOURCE_FILE_NAME_CONVERT clause or SOURCE_FILE_DIRECTORY clause is not required. The files are in the correct location. Therefore, NOCOPY is included. A file with the same name as the temp file specified in the XML file exists in the target location. Therefore, the TEMPFILE REUSE clause is required. The new PDB is based on the same unplugged PDB that was used to create an existing PDB in the CDB. Therefore, the AS CLONE clause is required. The AS CLONE clause ensures that the new PDB has unique identifiers. The XML file does not accurately describe the current locations of the files. Therefore, the SOURCE_FILE_NAME_CONVERT clause or SOURCE_FILE_DIRECTORY clause is required. In this example, the XML file indicates that the files are in /disk1/oracle/sales, but the files are in /disk2/oracle/sales, and the SOURCE_FILE_NAME_CONVERT clause is used. The path prefix must be added to the PDB's directory object paths. Therefore, the PATH_PREFIX clause is required. In this example, the path prefix /disk2/oracle/sales/ is added to the PDB’s directory object paths. The files are not in the correct location. Therefore, COPY or MOVE must be included. In this example, the files are copied. The CREATE_FILE_DEST clause is not used, Oracle Managed Files is not enabled, and the PDB_FILE_NAME_CONVERT initialization parameter is not set. Therefore, the FILE_NAME_CONVERT clause is required. In this example, the files are copied from /disk1/oracle/sales to /disk2/oracle/sales. The files are not in the correct final location for the PDB. Therefore, COPY or MOVE must be included. In this example, MOVE is specified to move the files. The CREATE_FILE_DEST clause is not used, Oracle Managed Files is not enabled, and the PDB_FILE_NAME_CONVERT initialization parameter is not set. Therefore, the FILE_NAME_CONVERT clause is required. In this example, the files are moved from /disk2/oracle/sales to /disk3/oracle/sales. The XML file does not accurately describe the current locations of the files. Therefore, the SOURCE_FILE_NAME_CONVERT clause or SOURCE_FILE_DIRECTORY clause is required. In this example, the XML file indicates that the files are in /disk1/oracle/sales, but the files are in /disk2/oracle/sales, and the SOURCE_FILE_DIRECTORY clause is used. The unplugged PDB is in a .pdb archive file named sales.pdb. The archive file includes the XML metadata file and the PDB’s files (such as the data files and wallet file) in compressed form, and these files are extracted to the current directory of the .pdb archive file when the CREATE PLUGGABLE DATABASE statement is run. Users in the PDB who used the default temporary tablespace of the source PDB use the default temporary tablespace of the target PDB. Users who used non-default temporary tablespaces in the source PDB continue to use the same local temporary tablespaces in the target PDB. See "About Managing Tablespaces in a CDB". User-created common users that existed in the source CDB but not in the target CDB do not have any privileges granted commonly. However, if the target CDB has a common user with the same name as a common user in the PDB, the latter is linked to the former and has the privileges granted to this common user in the target CDB. A proxy PDB provides access to another PDB in a remote CDB. You can use the CREATE PLUGGABLE DATABASE statement to create a proxy PDB by referencing the other PDB. You can create a proxy PDB by referencing a PDB in a different CDB. This technique creates a proxy PDB by referencing a PDB in a different CDB, which is referred to as the referenced PDB. You can use a proxy PDB when you want a local context for a remote PDB. In addition, when application containers in different CDBs have the same application, their application roots can be kept synchronized with a proxy PDB. To use this technique, you run the CREATE PLUGGABLE DATABASE statement in the CDB that will contain the proxy PDB. You must include the AS PROXY clause to specify that you are creating a proxy PDB. You must also include a FROM clause that specifies the PDB that the proxy PDB is referencing. You must specify a database link to the current location of the referenced PDB in the FROM clause of the CREATE PLUGGABLE DATABASE statement. The database link must be created in the root of the CDB that will contain the proxy PDB, and the database link connects either to the root of remote CDB or to the remote referenced PDB. Figure 38-12 illustrates how this technique creates a proxy PDB that references a PDB in a remote CDB. Description of "Figure 38-12 Create a Remote Proxy PDB"
You can create a proxy PDB in an application container. To do so, the referenced PDB must be an application root or an application PDB in an application container in a different CDB. The database link must be created in the root of the application container that will contain the proxy PDB, and the database link connects either to the root of remote application container or to the remote referenced application PDB. Figure 38-13 illustrates how this technique creates a proxy PDB in an application container based on a remote referenced PDB in an application container. Description of "Figure 38-13 Create a Remote Proxy PDB in an Application Container"
When you create a proxy PDB, you must address the questions that apply to creating a proxy PDB in Table 38-3. The table describes which CREATE PLUGGABLE DATABASE clauses you must specify based on different factors. "Synchronizing an Application Root Replica with a Proxy PDB"
Excluding ALTER PLUGGABLE DATABASE and ALTER DATABASE statements, when the proxy PDB is the current container, all SQL statements submitted for execution in the proxy PDB are sent to the referenced PDB and executed in the referenced PDB. The results of the remote execution are returned to the proxy PDB. For example, data definition language (DDL) statements, data manipulation language (DML) statements, and queries executed in the proxy PDB are sent to the referenced PDB for execution, and the results are returned to the proxy PDB. When the proxy PDB is the current container and ALTER PLUGGABLE DATABASE and ALTER DATABASE statements are executed, these statements only affect the proxy PDB. They are not sent to the referenced PDB for execution. Similarly, when the current container is the root to which the proxy PDB belongs, ALTER PLUGGABLE DATABASE statements only affect the proxy PDB. For example, an ALTER PLUGGABLE DATABASE statement executed in a CDB root, application root, or proxy PDB can open or close a proxy PDB, but this statement does not open or close the referenced PDB. As described previously, a database link is always required when you create a proxy PDB. However, after the proxy PDB is created, the database link specified during creation is no longer used by the proxy PDB. Instead, the proxy PDB communicates directly with the referenced PDB. If the referenced PDB’s listener does not use the default port number, then you must use the PORT clause to specify the listener’s port number. You can specify the port number when you create the proxy PDB, or you can alter the proxy PDB to change the port number. If the referenced PDB’s listener does not use the default host name, then you must use the HOST clause to specify the listener’s host name. You can specify the host name when you create the proxy PDB, or you can alter the proxy PDB to change the host name. Only password authentication is supported for sessions in a proxy PDB. The current user must have the CREATE PLUGGABLE DATABASE system privilege in the root of the CDB in which the proxy PDB is being created. The referenced PDB must be in open read/write mode when the proxy PDB is created. The open mode of the referenced PDB can be changed after the proxy PDB is created. A database link must enable a connection from the root of the CDB in which the proxy PDB is being created to the location of the referenced PDB. The database link can connect to either the root of the remote CDB or to the remote PDB. If the database link connects to the root in a remote CDB that contains the referenced PDB, then the user that the database link connects with must be a common user. If the database link connects to the referenced PDB, then the user that the database link connects with in the referenced PDB must have the CREATE PLUGGABLE DATABASE system privilege. The referenced PDB must be an application root or an application PDB in an application container. The application name and version of the proxy PDB’s application container must match the application name and version of the referenced PDB. When the proxy PDB is being created in an application container, a database link must enable a connection from the root of the application container in which the proxy PDB is being created to the location of the referenced PDB. The database link can connect to either the root of the remote application container or to the remote application PDB. If the database link connects to the root in a remote application container that contains the referenced PDB, then the user that the database link connects with must be an application common user. If the database link connects to the referenced application PDB, then the user that the database link connects with in the referenced application PDB must have the CREATE PLUGGABLE DATABASE system privilege. You can create a proxy PDB in a CDB root that is based on a referenced PDB in an application container. In SQL*Plus, ensure that the current container is the CDB root or application root in which the proxy PDB is being created. When the current container is the CDB root, the proxy PDB is created in the CDB. When the current container is an application root, the proxy PDB is created in the application container. Run the CREATE PLUGGABLE DATABASE statement. Specify the AS PROXY clause, and specify the referenced PDB with the database link name in the FROM clause. Specify other clauses when they are required. After you create the proxy PDB, it is in mounted mode, and its status is NEW. You can view the open mode of a PDB by querying the OPEN_MODE column in the V$PDBS view. You can view the status of a PDB by querying the STATUS column of the CDB_PDBS or DBA_PDBS view. If an error is returned during creation of the proxy PDB, then the PDB being created might be in an UNUSABLE state. You can check a PDB's state by querying the CDB_PDBS or DBA_PDBS view, and you can learn more about PDB creation errors by checking the alert log. An unusable PDB can only be dropped, and it must be dropped before a PDB with the same name as the unusable PDB can be created. The database link name to the referenced PDB’s CDB is pdb1_link. Either Oracle Managed Files is enabled, or the PDB_FILE_NAME_CONVERT initialization parameter is set. The SYSTEM and SYSAUX files will be copied to a new location based on the Oracle Managed Files configuration or the initialization parameter setting. You can use the DBMS_PDB package on a non-CDB to enable you to plug the non-CDB into a CDB. Starting with Oracle Database 12c Release 1 (12.1.0.2), you can create a PDB by cloning a non-CDB. This method is the simplest way to create a PDB using a non-CDB, but it requires copying the files of the non-CDB to a new location. See "Creating a PDB by Cloning an Existing PDB or Non-CDB" for instructions. Both the CDB and the non-CDB must be running Oracle Database 12c Release 1 (12.1.0.2) or later. If your current non-CDB uses an Oracle Database release before Oracle Database 12c Release 1 (12.1.0.2), then you must upgrade the non-CDB to Oracle Database 12c Release 1 (12.1.0.2) to use this technique. See Oracle Database Upgrade Guide for information about upgrading. Use the DBMS_PDB package to generate an XML metadata file. The XML metadata file describes the database files of the non-CDB so that you can plug it into a CDB. This method requires more steps than creating a PDB by cloning a non-CDB, but it enables you to create a PDB using a non-CDB without moving the non-CDB files in some situations. "Using the DBMS_PDB Package on a Non-CDB" describes using this technique. To use this technique, the non-CDB must be an Oracle Database 12c non-CDB. If your current non-CDB uses an Oracle Database release before Oracle Database 12c, then you must upgrade the non-CDB to Oracle Database 12c to use this technique. See Oracle Database Upgrade Guide for information about upgrading. Use Oracle Data Pump export/import. You export the data from the non-CDB and import it into a PDB. If the Oracle Database release of the non-CDB is Oracle Database 11g Release 2 (11.2.0.3) or later, then you can use full transportable export/import to move the data. When transporting a non-CDB from an Oracle Database 11g Release 2 (11.2.0.3) or later Oracle Database 11g database to Oracle Database 12c, the VERSION Data Pump export parameter must be set to 12.0.0.0.0 or higher. If the Oracle Database release of the non-CDB is before Oracle Database 11g Release 2 (11.2.0.3), then you can use transportable tablespaces to move the data, or you can perform a full database export/import. You replicate the data from the non-CDB to a PDB. When the PDB catches up with the non-CDB, you fail over to the PDB. See the Oracle GoldenGate documentation. This technique creates a PDB from a non-CDB using the DBMS_PDB.DESCRIBE procedure. You can move a non-CDB into a PDB by using the DBMS_PDB.DESCRIBE procedure. You run the DBMS_PDB.DESCRIBE procedure on the non-CDB to generate the XML file that describes the database files of the non-CDB. After the XML file is generated, you can plug in the non-CDB in the same way that you can plug in an unplugged PDB. Specifically, you specify the USING clause in the CREATE PLUGGABLE DATABASE statement. When the non-CDB is plugged in to a CDB, it is a PDB. 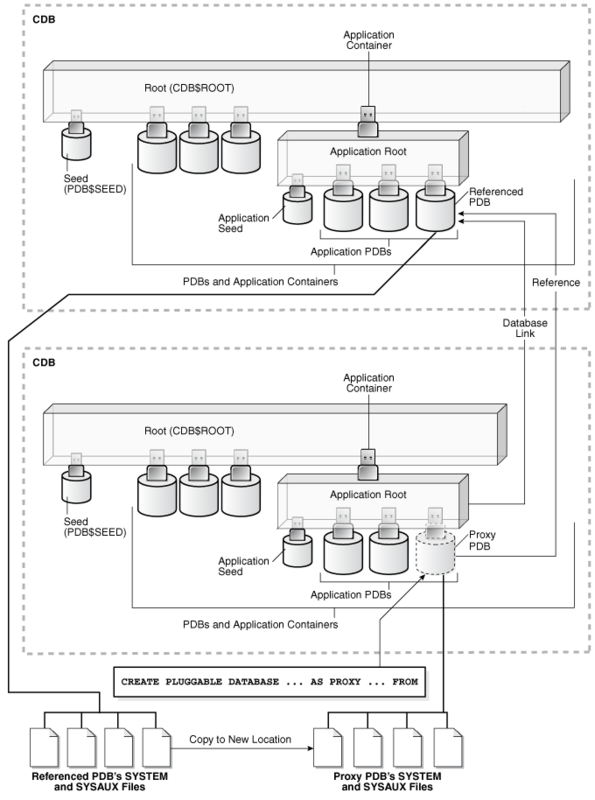 Description of "Figure 38-14 Plug In a Non-CDB Using the DBMS_PDB.DESCRIBE Procedure"
You can use the same technique to create a new application PDB in an application container. To use this technique, the non-CDB must be an Oracle Database 12c non-CDB. Create the CDB if it does not exist. See Creating and Configuring a CDB. Ensure that the non-CDB is in a transactionally-consistent state and place it in read-only mode. See "Opening a Database in Read-Only Mode". Connect to the non-CDB, and run the DBMS_PDB.DESCRIBE procedure to construct an XML file that describes the non-CDB. The current user must have SYSDBA administrative privilege. The user must exercise the privilege using AS SYSDBA at connect time. After the procedure completes successfully, you can use the XML file and the non-CDB's database files to plug the non-CDB into a CDB. Run the DBMS_PDB.CHECK_PLUG_COMPATIBILITY function to determine whether the non-CDB is compatible with the CDB. If the output is YES, then the non-CDB is compatible, and you can continue with the next step. If the output is NO, then the non-CDB is not compatible, and you can check the PDB_PLUG_IN_VIOLATIONS view to see why it is not compatible. All violations must be corrected before you continue. For example, any version or patch mismatches should be resolved by running an upgrade or the datapatch utility. After correcting the violations, run DBMS_PDB.CHECK_PLUG_COMPATIBILITY again to ensure that the non-CDB is compatible with the CDB. See "Shutting Down a Database". Follow the instructions in "Creating a PDB by Plugging an Unplugged PDB into a CDB" to plug in the non-CDB. If there are no violations, then do not open the new PDB. You will open it in step 8. The USER_TABLESPACES clause enables you to separate data that was used for multiple tenants in a non-CDB into different PDBs. You can use multiple CREATE PLUGGABLE DATABASE statements with this clause to create other PDBs that include the data from other tablespaces that existed in the non-CDB. Run the ORACLE_HOME/rdbms/admin/noncdb_to_pdb.sql script. This script must be run before the PDB can be opened for the first time. See "Creating a PDB Using a Non-CDB". "After Plugging in an Unplugged PDB"
Unplugging a PDB disassociates the PDB from a CDB. You unplug a PDB when you want to move the PDB to a different CDB, when you want to archive the PDB for later use, or when you no longer want the PDB to be available. You must meet prerequisites when unplugging a PDB. To unplug a PDB, connect to its CDB root or application root and use the ALTER PLUGGABLE DATABASE statement to specify an XML file or a .pdb file. When you specify an XML file (.xml extension), it will contain metadata about the PDB after it is unplugged. The SQL statement creates the XML file, and it contains the required information to enable a CREATE PLUGGABLE DATABASE statement on a target CDB to plug in the PDB. When you specify a .pdb file, it contains a compressed archive of the XML file that describes the PDB and the files used by the PDB (such as the data files and wallet file). A .pdb file enables you to copy a single, compressed file (instead of multiple files) to a new location to plug the PDB into a CDB. Description of "Figure 38-15 Unplug a PDB"
The following illustration shows how this technique unplugs an application PDB from an application container. The PDB must be closed before it can be unplugged. When you unplug a PDB, the unplugged PDB is in mounted mode. The unplug operation makes some changes in the PDB's data files to record, for example, that the PDB was successfully unplugged. Because it is still part of the CDB, the unplugged PDB is included in an RMAN backup of the entire CDB. Such a backup provides a convenient way to archive the unplugged PDB in case it is needed in the future. To completely remove the PDB from the CDB, you can drop the PDB. The only operation supported on an unplugged PDB is dropping the PDB. The PDB must be dropped from the CDB before it can be plugged back into the same CDB. A PDB is usable only when it is plugged into a CDB. You can unplug an application container only if no application PDBs belong to it. The current user must have SYSDBA or SYSOPER administrative privilege, and the privilege must be either commonly granted or locally granted in the PDB. The user must exercise the privilege using AS SYSDBA or AS SYSOPER at connect time. The PDB must have been opened at least once. If you are unplugging a PDB that includes data that was encrypted with Transparent Data Encryption, then follow the instructions in Oracle Database Advanced Security Guide. In SQL*Plus, ensure that the current container is the root of the PDB. If the PDB is plugged into the CDB root, then the current container must be the CDB root. If the PDB is plugged into an application root, then the current container must be the application root. If you are unplugging an application container, then the current container must be the CDB root, and the application container must not have any application PDBs plugged into it. In an Oracle Real Application Clusters (Oracle RAC) environment, the PDB must be closed on all instances. Run the ALTER PLUGGABLE DATABASE statement with the UNPLUG INTO clause, and specify the PDB to unplug and the name and location of the PDB's XML metadata file or .pdb file. This ALTER PLUGGABLE DATABASE statement unplugs the PDB salespdb and creates the sales.pdb archive file in the /oracle/data/ directory. The sales.pdb archive file is a compressed file that includes the XML metadata file and the PDB’s files (such as the data files and wallet file). When you drop a PDB, the control file of the CDB is modified to eliminate all references to the dropped PDB. Archived redo log files and backups associated with the PDB are not removed, but you can use Oracle Recovery Manager (RMAN) to remove them. KEEP DATAFILES, the default, retains the data files. The PDB's temp file is removed even when KEEP DATAFILES is specified because the temp file is no longer needed. When KEEP DATAFILES is specified, the PDB must be unplugged. INCLUDING DATAFILES removes the data files from disk. If a PDB was created with the SNAPSHOT COPY clause, then you must specify INCLUDING DATAFILES when you drop the PDB. See "Modifying the Open Mode of PDBs". In SQL*Plus, ensure that the current container is the CDB root, or, for an application PDB, the application root that contains the application PDB. If the PDB is plugged into the CDB root, then the current container must be the CDB root. If the PDB is plugged into an application root, then the current container must be that application root or the CDB root. If you are dropping an application container, then the current container must be the CDB root, and the application container must not have any application PDBs plugged into it. Run the DROP PLUGGABLE DATABASE statement and specify the PDB to drop.